Notice! If you are intending to put any of your children in a Japanese preschool/yochien please note that on October 15th most preschools release their application papers and relevant information, and that the preschools will start accepting the applications exactly on November 1st. It is recommended that you submit your forms on November 1st to secure a place for your child. This issue seeks to give an overview of the early education options available for children between 2-6 years, the various kinds of schools and philosophies available, the admissions process and a sampling of the costs involved in. There is an information gap for foreigners or “gaikokujin” especially for those who want their kids to integrate with the local community and become proficient Japanese speakers. Unless you have a reasonable command of Japanese, you are going to lose out to Japanese mothers will know everything to know about all the “good” schools simply from the rapid info exchanges that take place around in the neighbourhood parks and other communal areas. There are very few public preschools/kindergartens in Japan. Most are privately run … the reason being that preschool isn’t compulsory. Compulsory education begins from first grade of elementary school. Private preschool fees are costly here in Japan especially the upfront entry registration (not being privy to government subsidies), so I think we do ourselves a disservice not to know more what our kids are in for. We shall explore the pros and cons involved in entering your kid into a yochien. – You can pick up a list of yochiens and hoikuens (daycare nurseries)from your local town hall (shiyaku-sho). – On exactly October 15th the preschools released their application (moshikomi) papers and relevant information and the preschools start accepting the applications exactly on November 1st. – The various yochien have their own dates for “setsumeikai” that is, an explanation day, when parents can go to visit, walk around the schools, receive a briefing and participate in a Q & A session. Most yochien (with a few exceptions) require prior appointments. A few will welcome visitors anytime to look around. Interestingly enough, most Japanese parents do not ask at briefing sessions what the school methodology/philosophy is – they assume that all teachers are professionals and know what they are doing. The key considerations are borne out of “brand” consciousness ie whether the school is “ninki ga aru” (popular or not) and out of convenience, ie whether there are school-buses and whether they have to prepare lunchboxes everyday or not. Nor do they ask about bullying (ijime mondai). Foreigners tend to be concerned about “ijime” (bullying) problem and want to know how teachers will handle the problem, but locals just say it will make the kids stronger. – Yochiens commonly have three years of schooling: nensho (1st year), nenchu (2nd year) and nencho (3rd year). Yochiens and generally schools here in Kashiwa City with the surrounding expensive residential suburbs are said to be especially of a very high standard nationally…even real estate pamphlets highlight proximity to a good school as a key selling point. Costs are thus representative of the Tokyo and high-end Kansai area, so I hope that the following account of my yochien-hunting process will give interested parents a feel for the great variety of Japanese preschools available, as well as to ask the right questions and weigh all the factors carefully in assessing which school meets their child’s needs. As rumors fly, you may have heard tales of the notorious difficulty of getting into Japanese yochien. In my case, the rumors turned out to be true…even before the application date (November 1st) had come around, my son was already barred from entering these schools. Here’s my story : Here in Kashiwa, the two most popular (presumably the best) preschools in Kashiwa are Midori Yochien and Masuo-Daiichi Yochien. At some kindergartens (like Masuo-Daiichi Yochien), parents have to wait on a long line to get an application form. Some parents start waiting on a line at 2 – 4 am in the morning of October 15th in order to get one (this happens every year). Securing a copy of the limited few application forms is the only way of ensuring a place for your kid in such kindergartens. On the other hand, at some kindergartens (like Midori Yochien), you have wait on a long line to hand in the form. Some parents start waiting on a line at 2 am in the morning of November 1st in order to give them the form. Since it is all on a first-come-first-served basis and there are limited places available, you have to be able to hand in the form early in line to secure your kid a place in the kindergarten. As it turned out, my whole family was down with the flu so we didn’t pick up a copy of the Masuo-Daiichi yochien, so that that yochien had to be ruled out. I went to Midori Yochien conscientiously to visit, but when I went to pick up the application papers, they said they weren’t printing anymore because their 3 year-old and 4-year-old enrolments were at already full capacity. This left a lot of panic-stricken mothers in the neighbourhood. We surmise that families who already had a sibling in the preschool had probably gotten priority and filled up the places even though application papers were supposed to be accepted only from November 1st. Since my son had not gotten a place for the first year of these preschools, there was virtually no chance of him entering these “prestigious” preschools next year either. Fortunately for us, as we explored our options further, we think we actually found better options. 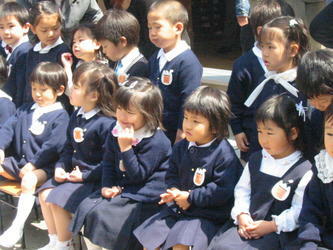 The Midori Yochien visit was scheduled on a school morning so that parents would be able to see the children in action. A very accommodating enchyo sensei (administrative head teacher) showed us all around. A middle-sized schoolyard generously (more so than others) equipped with a giant sandbox, climbing frames, tunnelstructures, slides, with two just-perfect-for-climbing real trees right in the centre. There was evidence that the kids had been gardening, and there were dogs, rabbits, hamsters for petting, even ducks too. The classrooms were really clean, with hundreds of crayons/colored pencils neatly displayed and very very bright with ground-to-ceiling windows. The corridors were clear for running children, staircases had beautiful stained-glass windows and there were a few Spanish art masterpieces hanging on the walls (as my Hispanofile friend of mine pointed out to me). The school actually had its own pottery furnace as the children made their own pottery work and other craft. As I asked about the actual teaching, the teachers said no writing was taught, not even basic hiragana recognition. The kyoiku hoshin (philosophy) was derived decades ago from some French school of thought (I could not make out the French name) plus a variety of other sources. However, class-size was reasonable around twenty-odd with three teachers each class as of next June (presently two per class). After our little visit around, hordes of children (4-6) tumbled out into the yard, they were the happiest looking kids I have ever seen in any school anywhere. The teachers looked young energetic, I saw quite a few were cheerful looking male teachers. I was told that the school aimed at healthy and “genki” kids (in the sense of physical and emotional well-being). This school as I had heard from many mums was infamous for its extremely long outdoor athletic activities, and was thus especially popular with mums with boys. As the older children returned to their classes, the 3 year-olds came out to play and I saw (through the windows) the returning kids crowding right close up to their teachers in what was probably a story-telling session. All in all, I would rate the preschool very high in ambience and environment, but I had great reservations about the fact that nothing academic was taught there (which the teacher admitted). Since my family is bicultural and I speak to my son only in English, I naturally wanted a Japanese preschool education to compensate for the lack of Japanese exposure at home. Although I did not visit the other most prestigious preschool Masuo-Dai-iichi Yochien, my neighbour who had sent her two girls there said that the school was just a playschool (asobi basho) and they taught no academics there either, no hiragana and no math, but that her girls had enjoyed themselves there. The third option was the biggest one. A family friend who sent her son there and whose daughter will attend next year, had said the Kashiwa Kindergarten was more balanced than most, not all play and not all work. But when I went to visit, I didn’t like the rather impersonal, concrete/brick, institution-like big building. The classrooms were big, but had no natural sunlight so that they had to make do with lots of florescent lighting. Parents here had to pay the school an unusual expensive monthly utility bill (airconditioning and heating) which other schools didn’t require. The fees were surprisingly the most expensive of the schools too. An equally impersonal (and boring) briefing to more than a hundred odd parents left me feeling quite depressed. Getting more stressed by the day as the application date approached, I gravitated towards Mikuni Yochien, a Japanese version of the Montessori school. It was a teaching methodology I was familiar with, and when I visited the school and found they had all the requisite Montessori equipment (see the Resource Appendix for more on the Montessori method). Fees were comparable with all the other Ks. However, it bothered me a little that the school building was a little dilapidated and that the children didn’t look as “genki” as elsewhere. Also, there was no school busing since the school intended that children should learn the practical value (hardship I think) of daily commuting and spend that travelling time in conversation with a parent. Furthermore, no meals were provided so mothers would have to prepare their kids’ obentos. With a new-born baby to look after next summer, the prospect of commuting daily and preparing obentos was not a welcome one. Then I went to pick up the moshikomi papers at Kaga Yochien. The school didn’t bother with making impressions and held no special briefings.It was come-when-you-please, ask all the questions you want and I was free to wander around. It was located within twenty minute walk (5 min drive) of home, and I was pleasantly surprised to see a pretty pink and white school building (with an equally pretty pink school-bus). It was right beside a decent public park but the yochien had its own schoolyard. I went inside the school, couldn’t find the administrative room and there were children spilling out of all the classrooms, everywhere. It was “free-playtime” just before the school-buses came to pick up the kids. It was a great din with kids talking at the tops of their voices and looking very lively. The playground was quite uncluttered, just a straight row of potted plants by the fence, but offered a large open space with real gym equipment (tumbling horse and mats), great climbing frames and two wonderful slides (the stainless-steel roller ones that rattle to the kids’ delight). The climbing frame was shaped like a tall pirate’s ship complete with sails and suspension-bridge gangwalks, and very colorful. My son attacked them with great glee. There were no gardening patches though, and no petting animals, the yard was very clean (no muddy compound)….a plus point for kids with dust and skin allergies. The classrooms were were interestingly decorated, bright with floor-to-ceiling windows, AND every classroom had a piano and tape-cassette/CD players! The school’s selling point was its key rhythm-and-movement curriculum (of the Swiss Danclaus rhythmic school) and as I looked in on the obento-hour, I watched the teacher singing and playing the piano as the children ate and listened to the music. The children looked a little wild to me, but that’s probably because it was free-play time and because of my all-girl convent background. Although a very activity-oriented curriculum, the school also taught both math and hiragana and even had English classes with a gaikokujin sensei.They also focused on aesthetics education, the appreciation of tea ceremony and other arts. Another interesting feature was that parents could elect to send their kids everyday (Mon-alternative Sats) or any flexible combinations of two, three or four school-days. A big minus point for me was the class size which teachers said could go up to 35 maximum although I saw quite a reasonable sized class for the 3 year olds. Although entrance fee was as high as most other yochien, the monthly tuition was the cheapest ranging between 5,000 yen to 13,000 yen. No uniforms were required hence no extra-cost there. School-busing was available for any option and the school provided catered obentos. Mothers had fewer PTA and other usual preschool duties than elsewhere which accounted for its popularity with foreigners. I have a very energetic and gregarious boy whose needs appear to be likely to met by coming here. My little just-out-of-his-diapers boy said “mama I really really like this school. I want to go everyday to this school”. So at the time of writing, this is where I intend to put him.